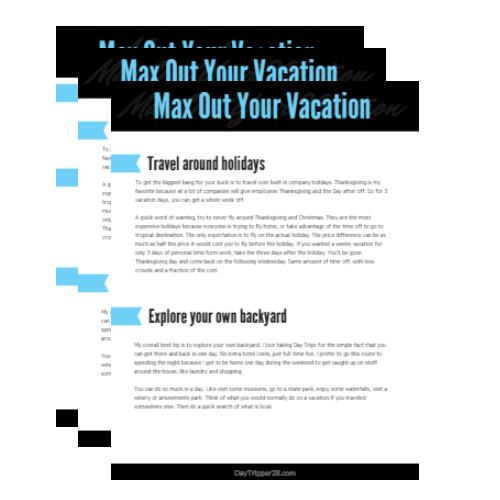 Get your Easy Guide to Maximizing your 14 Days of Vacation. Sometimes 14 days isn't enough. Find out how I manage to take over 28 vacations a year. Plan to use all 14 days of your Vacation TIme. Each year American's leave their PTO unused. Don't be one of them. After taking more than 28 vacations in one year, I've learned how to squeeze every ounce of vacation time. I'm showing you exactly how I do it. With a simple tool, you can be saving hundreds of thousands of dollars on airfare. I'll show you how you can go internationally for under $400, or domestically for just $85. and start maxing out the vacations. If I can stretch 14 vacation days into 28 vacations a year, so can you!